Thanks for the photos! I hope they get the money for it. Nice to see where the route would go. Do you think the New Cross bratch could be extended via St.Johns, Lewisham, Hither Green (platforms 1+2), Grove Park, then taking over the branch route to Bromley North via Sundridge Park. This would give access to even more people to reach East and North London quicker and easier. The only way to get to North London from Bromley is to take National Rail to London Bridge and then Underground service. Sow what does everyone think? Thanks for the update Mr Thant, very interesting as ever. Just before Christmas I, to my misfortune, found myself wondering around this area as I had to get to a parcel depot just off Surrey Canal Road. 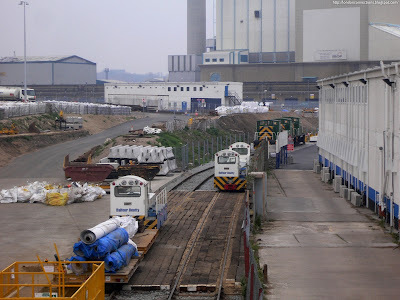 It was a bleak, cold and dark afternoon and it was faintly depressing, but it was quite fascinating just how much railway activity there is in such a small area. Do you have any info on the other end of ELLX Phase 2, i.e. Clapham Junction? At the moment the SLL goes from Wandsworth Road through to Battersea Park; is it simple enough for this to be linked to Clapham Junction instead? I seem to recall reading that the plan was to reinstate Platform 1 for the Overground - but isn't this completely the wrong side of the station? Is there a feasible way that the Overground could get there? There's existing track all the way to Clapham Junction platforms 1/2. Trains can turn left after Wandsworth Road which takes them under all the other tracks to the bottom of the West London Line, where they can either go straight on to Kensington Olympia or turn left to Clapham Junction. The route is used by freight a lot and I think one Cross Country train a week. Thanks for the photos. 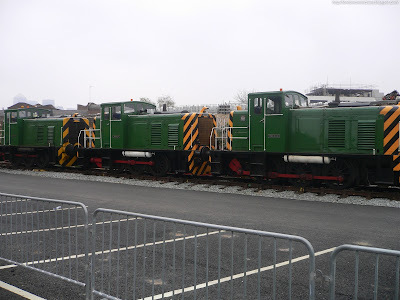 I had a look around the area a couple of years ago, and it is interesting to see how many different railways there are. However a hundred years ago there were even more. Is there any plan at any stage to have a stop at Brixton or Loughborough Junction. leaving aside the very long distance between Clapham High Street and Denmark Hill surely the public transport systems that function best are those that are best integrated tube/thameslink etc. Cheers all - I should've been less lazy and checked the maps before posting! Personally I think that the chances of a station being built at Brixton (on the line that ELL 2 will take) are pretty remote. Those lines (called the Atlantic lines, I believe) are on a very tall and narrow viaduct. 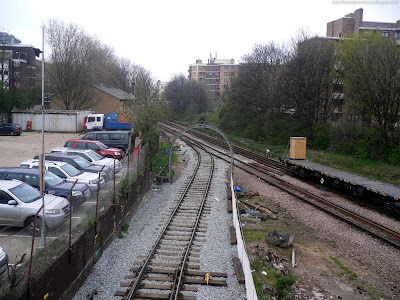 I think that it would be easier to build new platforms on the other lines (the ex-South-Eastern lines) tha run towards Denmark Hill. 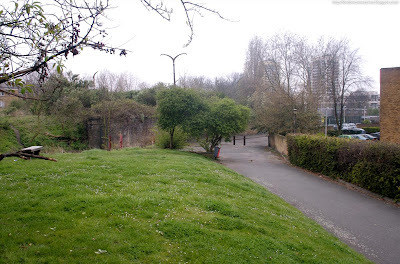 These lie between the existing Brixton station and the Brixton recreation centre. ELL couldn't serve such platforms, but it could provide a link from Brixton towards Denmark Hill and Peckham and beyond on the Southeastern services that go that way. The SLL would be much more useful if it had interchange stations at Brixton and Loughborough Junction, but I don't hold out much hope for either because, whilst TfL are keen on new lines (and I am all in favour of that), they have yet to realise that they also need good, easy to use interchanges if they are to get people out of their cars for cross suburban journeys. i think there are remaints of an up platform on the Chatham lines at Brixton, but i can't see a down. No there isn't a down platform on the Catford Loop lines at Brixton. Does anyone know if there ever was one? A new down platform there would need to be canterlevered out over the semi-pedestrianised street that has the recreation centre in it. It would need a separate entrance, similar to the existing up platform. However it seems to me that this is more feasible than building a station on the high viaduct that carries the Atlantic Lines. I think that East Brixton station was where it was (a good bit further east) because of the real difficulties of putting a station on the viaduct. I would like to see TfL (or someone else) do a real feasibility study of a station on the ELL at Brixton. We might then get a clearer idea of when it might get built. If the answer is never, or not for 25 years, sensible alternatives could then be developed. The present answer, that it might get built if there were the money, is a non-answer that prevents proper development of alternatives. Can't wait for the station to open near Millwall's ground, it will stop me running the guantlet at South Bermondsey all the time! As I happen to have recently moved back to this area I was pleasantly surprised to hear of this proposed western extension with particular interest to the Surrey Canal Road Station wehich would reduce my current commute to Docklands and the City by some 30+ minutes! I know this may be a stupid question and I am just looking for gut feelings but how likely is this Phase 2 proposal to come to fruition? Very informative btw thanks for all your efforts. Hi there, very informative. I'm local to the area. 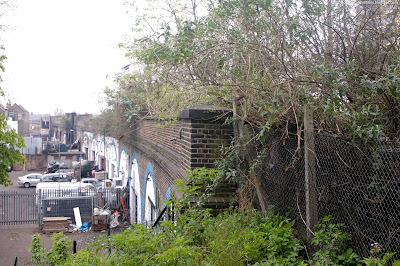 If you do a google image search on the proposed surrey canal road station you can see a small 3d visual by Arups. is there a way of getting more info on this? The northern line should be extended as far as watford as it will do justice to its comuters. people living in watford can only get to central london via rail link to camden or Euston. The slow overground that runs from watford is terrible as it almost takes over an hour to get to camden road station. we are paying so much tax i cannot understand why the public transport is still so bad in some areas, watford is the worst so far. Bus service in watford is just a joke you could be standing for over 30-40 minutes for a bus. I think Watford council really needs to look at the public transport in watford no wonder there is so much traffic everyday morning afternoon you name it. Any comments since the news announced on 12 February 2009 that the funding has been secured for the Western Extension to Clapham Junction? I'd be interested in any news on putting in stations at North Battersea, and also Brixton. I can't imagine the train going through Brixton without stopping. It really needs a Brixton stop to put Clapham Junction squarely connected to the Underground system. 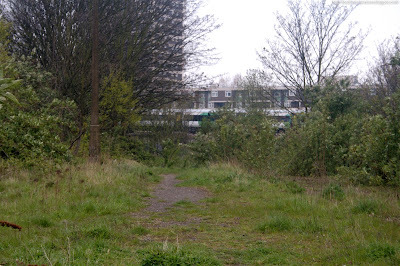 so presumably the path that leads from Somerfield street to Bridgehouse meadows will not be available as a footpath as the train line will using up this space . 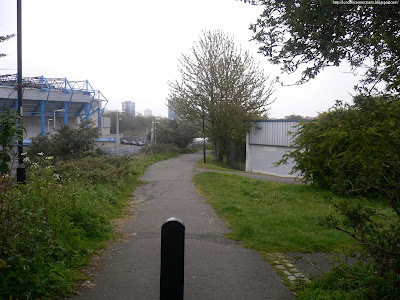 They need to keep the footpaths open accross bridgehouse meadows and the Surrey Canal Road. Blimey, those photos have brought memories flooding back! 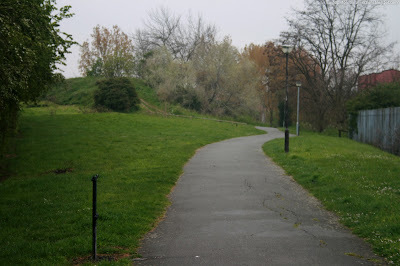 I was a kid living in Ilderton road during the early seventies and played along that old series of track beds and the old semi drained canal (now Surrey Canal Road). I bet they are now seriously regreting tearing up all those old lines, not to mention draining the canal... Just think of all the heavy freight that could have been taken off the roads! I also remember the old red iron railway bridge that crossed the canal at the point where the proposed station will hopefully be built... God knows how we never killed ourselves playing on it! Some great photos and interesting comments. 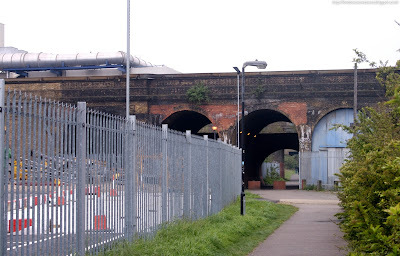 Yes, highly unlikely a station could be built on the Brixton Viaduct on the Atlantic Line (to become part of London Overground). It would be an excellent interchange but if you've seen how high up and narrow it is, you can easily the engineering problems. Thanks for this info, I am glad that trains are running along there again, after reading the history of the Surrey Docks, Bricklayers Arms etc. Pity poor old Battersea station was bombed, its only 2 mins from my house, now I have to walk to CLJ! Great photos too.